HRH Sultan Haji Ahmad Shah ibni Sultan Abu Bakar Riayatuddin al-Muadzam Shah (born 24 October 1930 at Istana Mangga Tunggal, Pekan) is the fifth Sultan of Pahang of Pahang, and also served as the seventh Yang di-Pertuan Agong of Malaysia from 1979 to 1984. Born Tengku Ahmad Shah, he was the only son of Sultan Sir Abu Bakar Riayatuddin Al-Muadzam Shah ibni Almarhum Sultan Abdullah Al-Mutassimu Billah Shah (reigned 1932–1974) by his official and royal consort, Tengku Ampuan Besar Fatimah binti Almarhum Sultan Sir Alang Iskandar Shah II Kaddasullah. A student of the Malay College Kuala Kangsar, he received diplomas in public administration from Worcester College, Oxford and Exeter University. He succeeded his father as sultan in 1974. 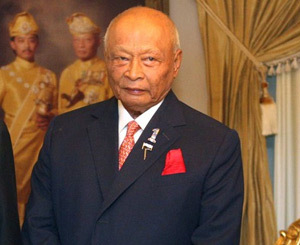 His election as Yang di-Pertuan Agong in 1979 was marked with controversy as he was said to be at odds with the incoming prime minister Dr. Mahathir Mohamad. However, the rumours proved to be untrue and he proved to be a keen admirer of the prime minister. A controversial, headstrong personality, he has often forced his chief ministers to resign over minor differences. Sultan Ahmad Shah is a keen sportsman and President of the Malaysian Football Association (FAM) and President of Asian Football Confederation (AFC) until 2002 and Asean Football Federation (AFF) 2011. His official and royal consort, Tengku Ampuan Afzan binti Tengku Panglima Perang Muhammad, a member of the Terengganu royal family, served as his Raja Permaisuri Agong but died of cancer on her return to Pahang on 29 June 1988. Sultan Ahmad Shah's junior wife Kalsom binti Abdullah (nee Anita), was designated as the Sultanah of Pahang in 1991.